DesignJam is a new service that offers design thinking & creative business skills for young startups & social innovators. DesignJam provides coaching, mentorship and practical, hands-on skills in design, business & futures thinking. For details and materials visit designjam.ocadu.ca. 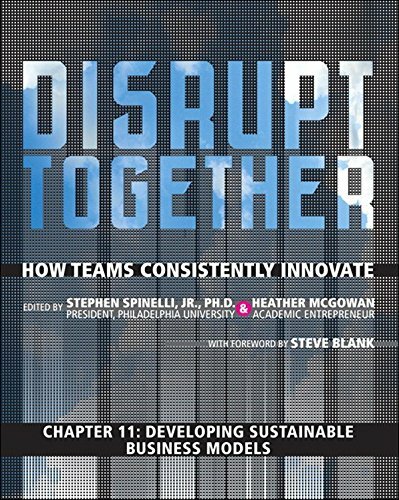 This is a chapter in the book "Disrupt Together: How Teams Consistently Innovate" [ISBN-10: 0-13-338441-X; ISBN-13: 978-0-13-338441-6] first published in December 2013. Foreword by Steve Blank. Available on Amazon as book or single chapter . In Developing Sustainable Business Models Nabil Harfoush, member of the faculty of OCADU's Strategic Foresight & Innovation program, reviews the foundations behind the various design tools for sustainable business models and provides a first attempt at matching Doblin's ten innovation categories with the nine fields of Osterwalder's Business Model Canvas. The book editors integrate a broad network of international leaders on innovation to demonstrate the tight linkages between innovation and opportunity recognition. Building on the successful and novel Strategic Design MBA program and the award winning Philadelphia University curriculum redesign that is reshaping how innovation is taught worldwide, these experts highlight how to identify relevant opportunities more effectively than ever before. The book covers every facet of innovation, including design processes, team development, ethnography, audits and charrettes, opportunity shaping and assessment, business models, value delivery, systems thinking, and more. Disrupt Together introduces a breakthrough transdisciplinary, team-based approach to innovation that integrates business, design and engineering, and can deliver powerful results for both new ventures and existing companies with case study examples from education, healthcare, branding, and consumer product and service design. The book will serve as the definitive companion text for a growing number of innovation and entrepreneurship programs that either follow the Philadelphia University model or have been influenced by it.